This story was originally published by The Guardian and is reproduced here as part of the Global Climate Desk collaboration. Eight months on, the picture could not be more different. The pigtailed teenager is feted across the world as a model of determination, inspiration, and positive action. National presidents and corporate executives line up to be criticized by her, face to face. Her Skolstrejk för Klimatet (school strike for climate) banner has been translated into dozens of languages. And, most striking of all, the loner is now anything but alone. On March 15, when she returns to the cobblestones (as she has done almost every Friday in rain, sun, ice and snow), it will be as a figurehead for a vast and growing movement. The global climate strike this Friday is gearing up to be one of the biggest environmental protests the world has ever seen. As it approaches, Thunberg is clearly excited. She was never quite like the other kids. Her mother, Malena Ernman, is one of Sweden’s most celebrated opera singers. Her father, Svante Thunberg, is an actor and author (named after Svante Arrhenius, the Nobel Prize–winning scientist who in 1896 first calculated how carbon dioxide emissions could lead to the greenhouse effect). Greta was exceptionally bright. Four years ago, she was diagnosed with Asperger’s. She has come to accept this as part of who she is—and made it a motivating force instead of a source of paralyzing depression, which it once was. At about the age of 8, when she first learned about global climate change, she was shocked that adults did not appear to be taking the issue seriously. It was not the only reason she became depressed a few years later, but it was a significant factor. Thunberg on strike last August. “I kept thinking about it, and I just wondered if I am going to have a future. And I kept that to myself because I’m not very much of a talker, and that wasn’t healthy. I became very depressed and stopped going to school. When I was home, my parents took care of me, and we started talking because we had nothing else to do. And then I told them about my worries and concerns about the global climate crisis and the environment. And it felt good to just get that off my chest. The global climate strike was inspired by students in Parkland, Florida, who walked out of classes in protest against the US gun laws that enabled the massacre on their campus. Greta was part of a group that wanted to do something similar to raise awareness about global climate change, but they couldn’t agree what. Last summer, after a record heat wave in northern Europe and forest fires that ravaged swathes of Swedish land up to the Arctic, Thunberg decided to go it alone. Day one was August 20, 2018. She kept her promise to strike every day until the Swedish national elections. Afterward, she agreed to make a speech in front of thousands at a People’s Global Climate March rally. Her parents were reluctant. Knowing Thunberg had been so reticent that she had previously been diagnosed with selective mutism, they tried to talk her out of it. But the teenager was determined. “In some cases where I am really passionate, I will not change my mind,” she says. Despite her family’s concerns, she delivered the address in nearly flawless English and invited the crowd to film her on their mobile phones and spread the message through social media. “I cried,” says her proud dad. People with selective mutism have a tendency to worry more than others. Thunberg has since weaponized this in meetings with political leaders and with billionaire entrepreneurs in Davos. “I don’t want you to be hopeful. I want you to panic. I want you to feel the fear I feel every day. And then I want you to act,” she told them. Such blunt talk has found a broad audience among people jaded by empty promises and eager to find a global climate leader willing to ramp up ambition. Thunberg’s rise coincides with growing scientific concern. A slew of recent reports has warned that oceans are heating and the poles melting faster than expected. Last year’s UN Intergovernmental Panel on Global Climate Change spelled out the dangers of surpassing 1.5 degrees Celsius of global climate warming. To have any chance of avoiding that outcome, it said, emissions must fall rapidly by 2030. 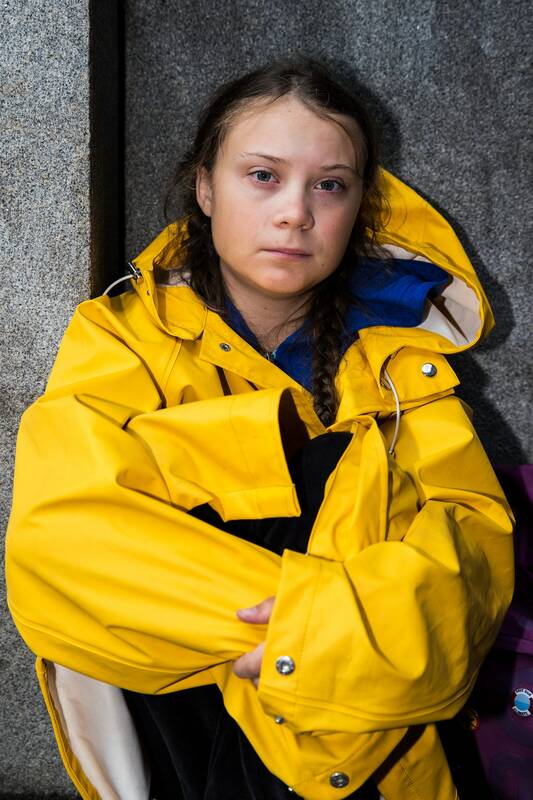 That will require far more pressure on politicians—and nobody has proved more effective at that over the past eight months than Thunberg. The girl who once slipped into despair is now a beacon of hope. One after another, veteran campaigners and grizzled scientists have described her as the best news for the global climate movement in decades. She has been lauded at the UN, met French president Emmanuel Macron, shared a podium with the European Commission president Jean-Claude Juncker, and has been endorsed by the German chancellor, Angela Merkel. You may think this would put the weight of the world on the 16-year-old’s shoulders, but she claims to feel no pressure. If “people are so desperate for hope,” she says, that is not her or the other strikers’ responsibility. While she has little time for chitchat, she gets satisfaction from speaking to a big audience about climate change. Regardless of the size of the crowd, she says she does not feel the least bit nervous. She seems incapable of the cognitive dissonance that allows other people to lament what is happening to the climate one minute, then tuck into a steak, buy a car, or fly off for a weekend break the next. Although Thunberg believes political action far outweighs individual changes to consumer habits, she lives her values. She is a vegan and only travels abroad by train. Some people consider this a threat. A handful of fossil fuel lobbyists, politicians, and journalists have argued Thunberg is not what she seems—that she was propelled into prominence by environmental groups and sustainable-business interests. They say the entrepreneur who first tweeted about the Global climate strike, Ingmar Rentzhog, used Thunberg’s name to raise investment for his company, but her father says the connection was overblown. Greta, he says, initiated the strike before anyone in the family had heard of Rentzhog. As soon as she found he had used her name without her permission, she cut all links with the company and has since vowed never to be associated with commercial interests. Her family says she has never been paid for her activities. In a recent interview, Rentzhog defended his actions, denied exploiting Greta, and said that global climate change, not profit, was his motive. She intends to strike outside parliament every Friday until the Swedish government’s policies are in line with the Paris climate agreement. This has led to what she calls “strange contrasts”: balancing her math homework with her fight to save the planet; listening attentively to teachers and decrying the immaturity of world leaders; weighing up the existential threat of global climate change alongside the agonizing choice of what subjects to study in high school. It can be grueling. She still rises at 6 am to get ready for school. Interviews and writing speeches can leave her working 12- to 15-hour days. “Of course, it takes a lot of energy. I don’t have much spare time. But I just keep reminding myself why I am doing this, and then I just try to do as much as I can.” So far, this does not appear to have affected her academic performance. She keeps up with homework and is in the top five in her class, according to her father. And now that she is active on global climate change, she is no longer lonely, no longer silent, no longer so depressed. She is too busy trying to make a difference. And enjoying herself.